Since we updated our info just a few days ago, we have had another s/n day. On Thursday, 8/9, we sent 10 friendlies to ADOPT, 5 males, 5 females – thank you to Charli and Dedra for transporting! We also sent 5 cats to DCAS – 1 feral, 4 friendlies, of which 4 were males and 1 was a female – thank you Debbie for transporting! This brings us to 15 on Thursday, 48 for August, 359 for the year and 10,676 since 2007. Many thanks to the fosters who trek to my house at 7:15AM and then come back that same evening to get their kitties! I am constantly being asked what is going on with our building. Because Feral Fixers does not fit into any predetermined cat – egory, it has been a challenge. We finally found a building in Lombard that we could make work only to find out that, after being told for over a year that we would be welcomed into Zone 2 or Zone 5, we’re not a fit. Now we are told that we can take up residence in the Industrial Area, unfortunately there are no buildings for sale in that area. This sends us back to the drawing board, and the hunt continues. Stay tuned. There are a dizzying number of events in the next two months! Please consult our Events page for more details. 8/11 Adoption Event at Pet Supplies Plus in Naperville – so many kittens! Update: Seven went home! 8/12–18 Five Below – shop for those last-minute, back-to-school needs or cat-themed stuff, or maybe both! 8/14 Portillo’s fundraiser – show your flyer at the register OR the first person you see at the drive-thru – help us make our goal! 8/18 Clear the Shelters! 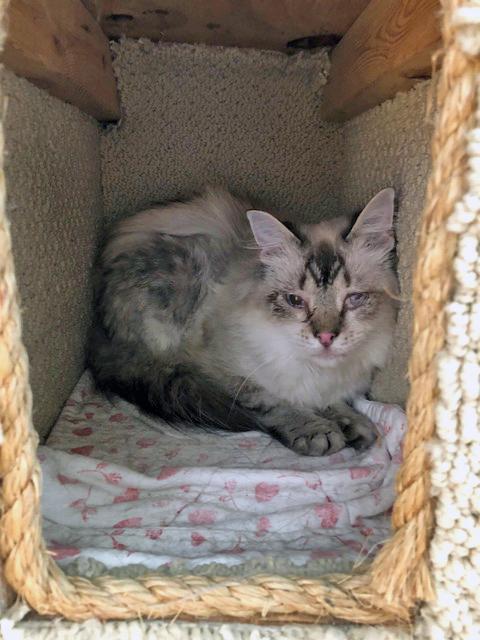 In partnership with DuPage County Animal Services, we will have kittens for adoption in their new mobile unit – they can be seen from the outside, space is small so only pre-approved or adopters who have filled out an application will be admitted. 8/25 Pints for Paws We’ve been invited to participate in an event at Crosstown Bar and Grill – we’ll have a couple of kittens there and lots of information about all of our adoptables! 9/15 Get Needled for Feral Fixers! – an acupuncture fundraiser – do we have unique events or WHAT! 9/22 Two Bostons Adopt-A-Rama – come out and see some of our adoptable kitties! 9/30 Join us at West Suburban Humane Society’s Barkapalooza – always a great time! 10/16 Wine & Whiskers fundraiser at Lynfred Winery in Roselle – Social event of the year! There may be even more events popping up, so stay tuned! This year has definitely been one of change. You may have noticed that our numbers are down. This time last year we had neutered 514 cats and our total right now is 359. We lost a volunteer who put in 60 hours a week and impacted many facets of the process, additional volunteers who had grown into their jobs and therefore needed two to three people to replace them, and so on. We used to be able to respond same day to a crisis – bottle babies, injured cats, etc, that is not always possible now. We were overwhelmed before, just don’t know the word for what we are now. It is not easy to volunteer for us, we’re not like any other rescue, we get volunteer applications but our requirements result in very few people actually volunteering with us. We’re not horrible people but what we do is time-consuming and is not a simple, two hours on Tuesday kind of thing (a building would help with that). Trapping, for instance, requires someone who can schedule their own time, work with difficult people and improvise on the fly, yet follow what we have determined to be the best way to do TNR. When we say, tell us what you can do and we’ll find a use for you, we mean it, not everyone can do every facet of the process. Keep us in mind when you have breaks in your schedule or when you retire, if we can use you it will be a huge gift to Feral Fixers. But don’t be upset if it just isn’t the right time or task availability, that happens. In addition to the basic s/n package of surgery, vaccines, flea treatment, microchip, we also provide additional services to the feral and stray cat population. We’ve done many dentals on 8yr old ferals, wound care, upper respiratory, you name it! There are many cats that would not have survived but for our intervention. Here are some stories from May of this year. One of our recent stories involved a cat we named Chip. A 2yr old Ragdoll mix, we learned a lot about him thru his chip. He started out in Alaska, was adopted out thru a shelter there and had an eye defect at that time. His people moved to Wisconsin and after a time, adopted a puppy and Chip was then put outside - abandoned. Our volunteer took him in, knew he had issues. His eye was re-checked, found to be stable. He tested negative for FELV/FIV but had severe stomatitis. 14 teeth were extracted, all of those behind the canines, lower and upper, both sides. Chip felt so much better after the procedure! He has gone on to be adopted, his adopters went on with another dental as the inflammation with the other teeth got worse, and the rest of his teeth were removed by their vet. Our cost for Chip was $1,200. He should go on to have a great life now, despite the rocky start. So many thanks to the adopters for their great care! May was definitely a month for dentals. One of our adopted cats, Alamo, spent a very long time in foster before being adopted to a wonderful couple. Although he had a dental before adoption, he also needed an extensive return visit, which we helped with at a cost of $600. He is doing so very well now!!! Corn is an FIV+ cat that had labwork and a dental at a cost to Feral Fixers of $250. 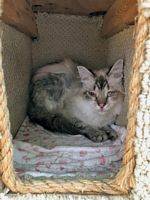 Many thanks to his adopters who are taking great care of him and did not let his FIV status deter them from bringing him home! In addition to these stories there were snap tests for cats that decided to come inside, vaccinations, Convenia shots, fluids given, medications that could only be obtained from our vet. Our total for just May was $2,379. The numbers add up and while we do as much as we can ourselves and think more about the cat’s quality of life versus our own feelings, medical care for the cats that we support can amount to $36,000 a year. With the “As If They Were Our Own” fundraiser, we would ask that you donate to help us continue to care for those cats that have no other support in place, have encountered health challenges thru no fault of their own, and have caretakers who are struggling to keep them well-fed and do not have that extra $100 it would cost them at their vet for a shot of antibiotic. This is another Giving Grid fundraiser and will run from August 15th to October 15th to give our donors plenty of time to donate. We have already received pledges of donations to be matched in the amount of $3,400! Click on the link and follow the prompts, share a picture or a note and help us continue to help the stray and feral cats by matching the funds! If the funds are matched, that would bring the total to $6,800 and equal to more than two average months of vet costs! That would be awesome!